This festive season I request you to add some Do good to the Feel good factor in your life. Help me pay it forward. Help me help The Color Caravan add some new programs to their winter session. I am all for helping out and paying it forward. I don’t have money lying around to give away but I do have some skill that can be used to generate funds to help those less fortunate (at this moment in time) but more in need. So to put my money where my mouth is, I am putting these two paintings on sale. 100% of the sale money will go directly to The Color Caravan. Yes. You read that right. It will not hit my bank account at all. I use my skill, you buy and get a wonderful painting, all the while knowing that in return 100% of your money goes to enrich the lives of people who do not have access to the opportunities that maybe god has so kindly given us. It’s a win-win for everyone. These are priced at 7500/- INR each. It’s an effort to help out and not give a hand out. I launched The Poonchh Collection in Feb 2012 and since then it has been my dream to do something for women and children as well. Over the years many ideas have come to me and have seen varying degrees of success. You can read about You can read about them here, here and here. I have learned something from each – as should be the case I might add. Till I am able to do the girl child/woman collection on a grand scale I am looking to continue with smaller efforts to help out. Towards that end I have painted these portraits of two stunning women inspired by my friend Swati Seth’s photography. Please note – They are only inspired and in no way are attempts to be photo-realistic renditions of the subjects. Swati is the kind of self-less soul I aspire to be. She is also the force behind The Colour Caravan. The funds would be used to conduct a skill training (natural dye making & dyeing) program for our women and also to teach new life & creative skills to the kids. If you would like to buy either or both of these paintings please write to The Colour Caravan directly. They will follow up on the sale and provide bank account details to you directly. I will ship the painting from here to the required address anywhere in India. Please note – The address must have a valid pin code and a valid working phone number. For an international ‘ship to’ address I would be charging shipping as actuals. The price of which will be communicated to you via Swati. The Color Caravan is a social enterprise that was started by Swati Seth in 2010. It started of by partnering with artisans and weavers at a grass root level, to not just source but also co-create products for the urban and global markets. Back then the venture was working with some 12 traditional craft techniques along with artisans & weavers from 8 states in India. However, in 2016, Swati wrapped up the work she was doing with these artisan & craft communities and moved to a village in Himachal Pradesh to live in the hills and work with the mountain community. Yes! I know – amazing isn’t it!! Currently, The Color Caravan is focusing only on the work it is doing in Himachal Pradesh via its two initiatives – The Wool Folk Project & Project Kala Jamghat. 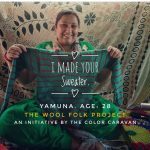 The Wool Folk Project is an initiative by The Color Caravan to empower the mountain community, especially women, in the Indian Himalayan state of Himachal Pradesh, through skill up gradation, new skill development, capacity building & giving employment to them. Started with 3 women in September 2016, the initiative is currently working with roughly 33 women using skills like hand crocheting, hand knitting, hand spinning, weaving & sewing. We recently organized a 10 day long hand embroidered training program for some of our women and would be integrating the skill to develop new products. 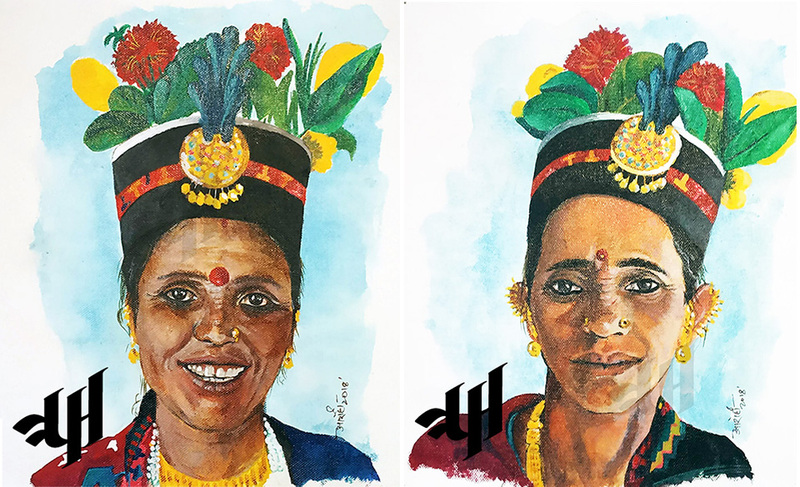 Project Kala Jamghat is an initiative by The Color Caravan to teach life & creative skills to the mountain community (primarily children and adolescents) in the Indian Himalayan state of Himachal Pradesh. We’ve conducted theatre workshop, storytelling sessions, nature art, origami craft and multiple other art sessions with the kids in the past. This entry was posted in Acrylics, Effortless friendships, Event, Happy Happenings, narrative story telling, Portraits, Thoughts. Bookmark the permalink.